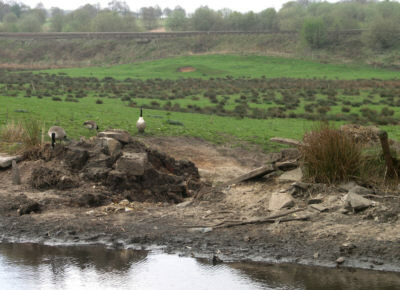 A Castleton farmer has been given a suspended prison sentence following damage caused to the bank of the Rochdale Canal, adjacent to Maden Fold Farm, which had kept the canal closed for two months. See below for more details of the damage.
" 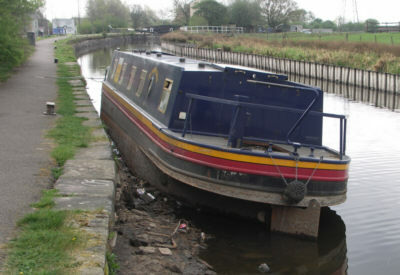 British Waterways yesterday (Wednesday 13th June) attended a court hearing following incidents of damage caused to the Rochdale Canal on Thursday 8 February and Wednesday 11th April 2007. An individual, Mr Christopher Jones was issued with a court injunction on 14th February, which was continued on the 9 March, following the original damage caused to the embankment on Thursday 8th February. The court injunction was issued to protect the integrity of the canal and the surrounding environment from further harm. Mr Christopher Jones has admitted to breaching the injunction, when he carried out the further act of vandalism on Wednesday 11th April. Mr Christopher Jones has been sentenced to three months imprisonment for the breach of the injunction, suspended for two years, subject to Mr Jones not breaching the injunction within that period. We are satisfied with the outcome of the hearing. 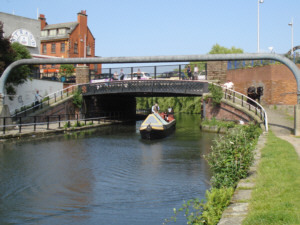 British Waterways purpose in bringing these proceedings for committal was to ensure that the canal can be peacefully operated and that the injunction complied with. We hope that today's decision will allow us to do this. The cost to repair the damage which was caused to this historic waterway is estimated at approx £150k plus fees. 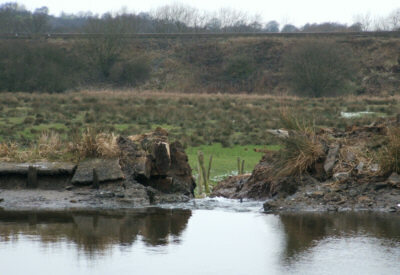 British Waterways have been carrying out repairs to the damage after receiving the necessary consents from Natural England. Navigation has now been re-opened with temporary restrictions for through passage between 6th - 22th June, whilst contractors work on site. British Waterways takes incidents of this sort to our waterway very seriously and throughout this distressing ordeal, British Waterways has worked closely with Greater Manchester Police and our legal specialists. We remain committed to improving, caring for and developing the Rochdale Canal into the future together with and for the benefit of the local community who already enjoy this magnificent canal. " A vehicle has fallen into the canal at Lock 66, blocking the navigation. BW teams are currently on site arranging the lift out of the vehicle. Boats are not currently being allowed between Locks 66 and 83. Update: The canal has now re-opened. Anyone requiring the latest information can contact British Waterways on 01942 405700. A flotilla of boats will be braving the tidal Mersey for the last time to reach the historic South Docks in Liverpool. As part of the celebration of Liverpool's 800th birthday, a large number of boats old and new have made their way along the Leeds and Liverpool Canal to the terminus at Eldonian Village. Many of them will continue down the Stanley Dock branch to Collingwood Dock. From there, the flotilla will proceed through the North Docks to Langton Lock and out onto the Mersey estuary. The boats will then cruise up the river, past Liverpool's famous waterfront, to enter the South Docks at Canning Dock, for the "Coal and Cotton" canal boat rally. The boats will moor at Salthouse Dock, adjacent to Albert Dock, for a week before returning via the reverse of the above route. A large number of boats have booked for this event as it is the last time that this escorted passage will be available - next year the Canal Link will open, so boats will be able to reach the South Docks without going out onto the Mersey. It is also the last year when canal boats crossing to Eastham will use Langton Lock, as they will use the southern dock entrance once the Canal Link is open. The passage is fully booked, and a number of boats will remain at Eldonian Village. Right: Assembled boats at Eldonian Village, Liverpool; passing the famous Liverpool waterfront. BW has announced an emergency stoppage between Locks 87 and 88 in Wigan. 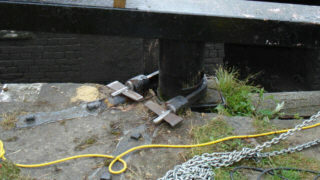 The offside ground paddle on Lock 88, Pagefield Lock, has been damaged. Emergency repairs started today. The pound between Locks 87 and 88 has suffered from rapid water loss and is not navigable. This is the pound that passes Wigan Pier. Boaters wishing to travel westwards are being asked to moor up by the Waterway Office between Locks 86 and 87. 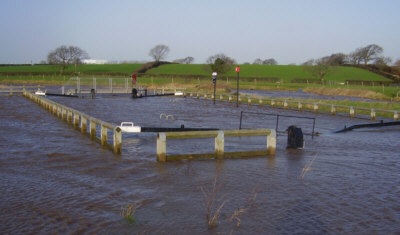 This does not effect boaters travelling between the Leigh Branch and the main Wigan lock flight. An update notice will be issued once it is known how long the work will take. Update (June 10th, 10.30 am): The canal has now now re-opened. The historic boat "Maria" has now reached Liverpool. She had been horse drawn from Manchester to co-incide with the World Canals Conference. See below for more details. It is hoped that the return journey from Liverpool to Ashton under Lyne will start on or around June 18th. Right: Crossing the changeline bridge at Stanley Road, Bootle. Below: Passing the old warehouses at Bank Hall; Approaching Eldonian Village. More photos of the journey in the Horseboating Society website "Gallery" section. 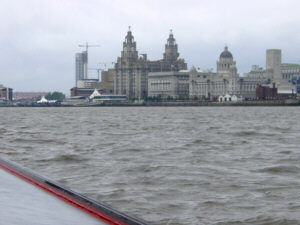 The historic boat "Maria" is being horse drawn to Liverpool to co-incide with the World Canals Conference. The journey from near Ashton under Lyne has been done in stages. "Maria" has been towed by Queenie and crewed by members of the Horseboating Society. The boat will travel the short distance from Lydiate to Aintree on June 5th and the rest of the way through Litherland and Bootle to Eldonian Village on June 6th. This is thought to be the first time in over 40 years that a horsedrawn boat has travelled on the Leeds and Liverpool Canal through West Lancashire. "Maria", built in 1854, is believed to be the oldest survivng wooden narrowboat. 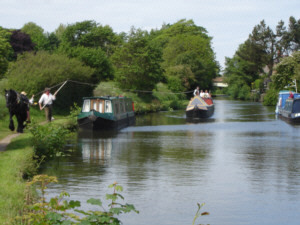 Right: Lifting the line over a moored boat near Lydiate on the Leeds and Liverpool Canal. 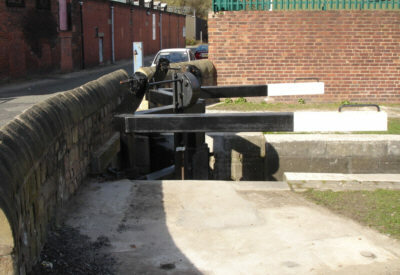 Damage to a lock gate forced a temporary closure of the Ashton Canal. The canal has now re-opened. 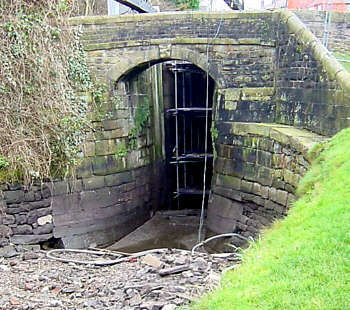 The damage was to the top gate of Lock 14, on the Clayton flight. The damage was sustained on Saturday evening (9th June) as a result of the bow of a boat becoming stuck between the gate and the balance beam as the boat rose in the lock. Eventually the boat lifted the gate from its location, damaging the collar fixings that held the gate in place. New steelwork had to be fabricated to repair the damaged collar. The lock was closed until Tuesday afternoon (12th June) when the lock re-opened a day ahead of schedule. Photos: Top - BW ground staff lift the gate back into position using a "Porta-Gantry". Bottom - the repairs to the collar fixings that hold the gate in place. There is an opportunity to treat your father to something out of the ordinary at Standedge Tunnel on June 17th! Kevin Fisher , Leisure Business Manager for British Waterways Yorkshire said: "I know that everyone who comes to Standedge really enjoys the experience of going into the tunnel and learning about the history of this canal from our experienced guides." The guided boat trips into the tunnel last around 30 minutes. Entrance is free to the nearby Visitor Centre detailing the history of the restoration of the tunnel and canal. Refreshments are available at Tunnel End Cottages. Forthcoming events at Standedge include amazing displays with birds of prey on Falconry Day on Saturday 23rd June for just £3.50 or an opportunity to learn traditional canalware painting on Saturday 14th July at a Roses & Castles Workshop on Saturday 14 July for £50 (booking essential: contact Simon Henry on 0113 281 6800). See next item for more information. To celebrate the 250th anniversary of the birth of Thomas Telford, a plaque was unveiled at the Diggle portal of Standedge Tunnel. 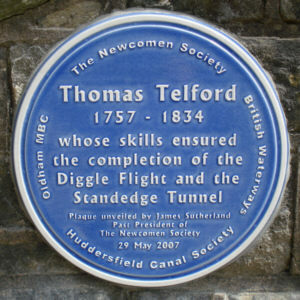 The plaque, funded by the Newcomen Society and the Huddersfield Canal Society, acknowledges the part played by Telford in rescuing the faltering canal project and ensuring its completion. It was unveiled by veteran waterways campaigner James Sutherland, who, in 1948 has been aboard Ailsa Craig, which passed through Standedge Tunnel and was the last boat to travel the full length of the canal before it closed. 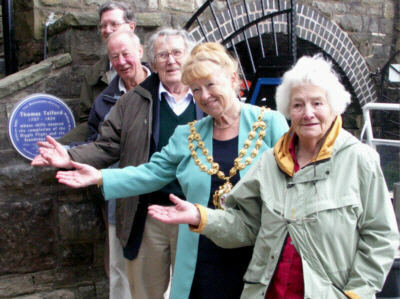 Also present at the unveiling was Sonia Rolt, whose husband Tom had also been aboard Ailsa Craig. She spoke passionately about the threats facing our waterways in the light of the recent funding cutbacks. James Sutherland and Sonia Rolt joined a group of Newcomen Society members in a walk up the Diggle lock flight, built to Telford's specifications. 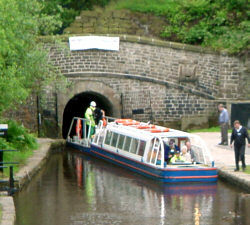 After the unveiling, they travelled through Standedge Tunnel to Marsden on one of the modern electric tunnel passenger boats. Photo, below: left to right - Michael Bailey (North West chairman of the Newcomen Society), Alwyn Ogborn (Huddersfield Canal Society), James Sutherland, Ann Wingate JP (Mayor of Oldham) and Sonia Rolt. 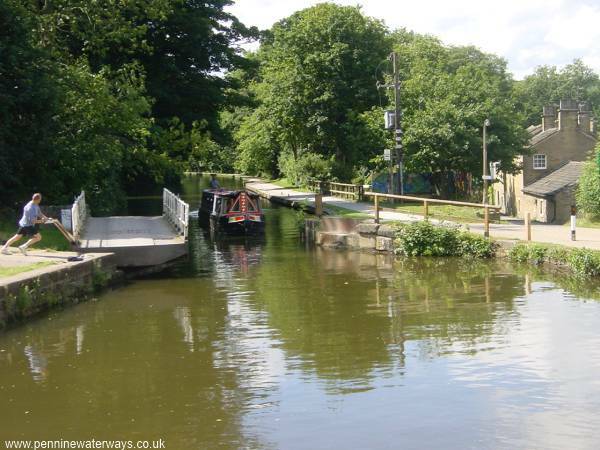 British Waterways has announced the re-opening date for the Rochdale Canal near Castleton. (see below for details of stoppage). Work to repair the bank began on schedule on 29th May, and the canal is to re-open on June 6th. Contractors will still be on site until June 22nd, so some temporary restrictions may be in place. Boaters may be required to wait while contractors relocate their equipment, but this will be no longer than 1 hour. There has been further damage to the Rochdale Canal near Trub, Castleton, following the deliberate damage to the bank reported earlier (see below). The balance beams of all four gates at Lock 53, which is adjacent to Maden Fold Farm, have been sawn off. Three of the sawn-off beams are lying on the ground where they fell. The fourth is lying in the canal below the bottom gates. British Waterways is still waiting to receive consent from Natural England to repair the damage to the bank near Lock 53 (see below). A number of boaters are very disappointed that their holiday plans to cruise the Rochdale Canal have been ruined. 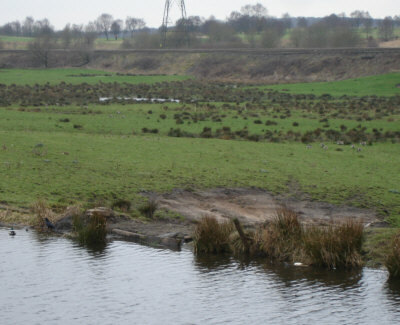 The land adjoining the canal at Trub belongs to Chris Jones, the farmer who has been involved in a protracted dispute with BW and who blocked Lock 53 with the arm of his fork lift truck in 2001. 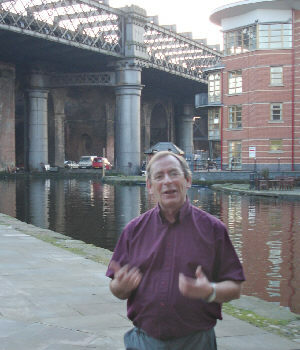 Mr Jones made the news in 2002 when he jumped into the water ahead of the boat carrying the VIPs to the official opening ceremony of the Rochdale Canal. Mr Jones feels that British Waterways have not provided adequate access to his farm when his original access road, through the M62 tunnel, was converted into a canal tunnel to enable the canal to re-open. Photo, top: The damaged head gate beams. Photo, bottom: One of the damaged tail gate beams. The Ashton Canal will be closed for one day between Fairfield and Clayton following an act of vandalism. Vandals have drained the pound at Lock 16. This is the long pound that includes the two swing bridges. 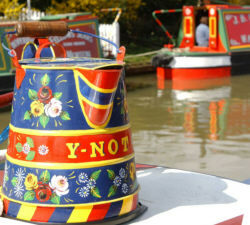 BW staff are re-filling the pound and the canal will re-open on Saturday 21st April. Photo: Lock 16 on the Ashton Canal. 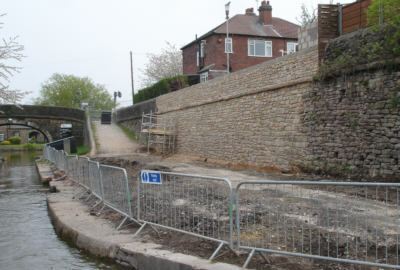 Major repair works in Marple to repair a collapsing wall and to renovate a failing lock have now been completed. The photos on the right show the retaining wall, alongside the first few yards of the Macclefield Canal at Marple. The top photo shows the wall after the repairs have been completed. The lower photo shows the wall temporarily stabilised with gabions before repairs were carried out. Many thanks to "Dave", who kindly sent in the photographs below of the repairs being carried out to the wall and to the nearby Lock 15. The first two photos below photos show how the narrow former stop-lock had been braced to prevent any movement of the bank as vehicles work alongside. A short section of canal had been infilled so that a temporary road could be constructed across the canal to provide access to the site. This meant the temporary closure of this link between the two canals. A gantry had been built across the section of wall being re-built from which to suspend service pipes. 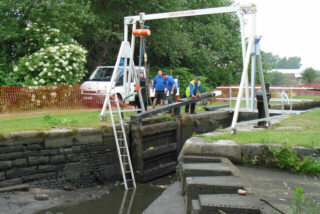 Repair work was also under way at the nearby Lock 15 on Marple lock flight. This lock had to be closed unexpectedly before Christmas when investigations found subsidence and extensive voids in the ground adjacent to the lock wall. The work was carried out under strict conditions due to the lock being a listed structure. The Rochdale Canal has been closed once again near the M62 crossing at Trub, near Castleton, following further damage to the bank. This has destroyed the temporary repair made by British Waterways following previous damage (see news item below). British Waterways hopes to pile the bank along this stretch, working from a boat, but is awaiting consent from Natural England, as the area is within a protected Site of Special Scientific Interest. 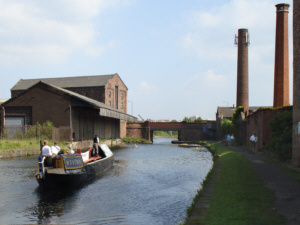 British Waterways is hoping to re-open the canal as soon as possible once consent is obtained. Following the original damage in February, British Waterways obtained a Court injunction against certain individuals prohibiting them from causing any harm to the historic waterway. It remains to be seen whether the same individuals are resonsible for the latest damage and whether any action will follow. Photo, top: The site of the damage, showing a fresh cut through the bank. Photo, bottom: Community boat Spirit of Oldham is beached at the other end of the pound, above Slattocks Locks. If you have ever admired decorative canal art, featuring Roses and Castles, which is a familiar sight on the canals, then you have the chance to learn the craft from an expert on one day courses offered at at Standedge Visitor Centre in May and July. The easily recognisable style of paintwork dates back to the Industrial Revolution and can include a number of different flowers featured alongside castles or big country houses. The decoration is seen on the picture panels of narrowboats and on household items such as water jugs, buckets and horses feed tins. The "Roses and Castles" workshops are running on two dates this summer - Saturday 26th May and Saturday 14th July as part of Standedge Tunnel & Visitor Centre's 2007 event programme. The course is designed for all levels and the cost of £50 covers expert tuition, a set of professional brushes to practise the new skill with and a decorated item to take home. The course tutor is Kris Johnson, who studied at Hull College of Art and Design before running his own painted furniture and effects shop using canal work for decorative items. For more information about Standedge Tunnel and Visitor Centre, see www.standedge.co.uk or phone 01484 844298 or 0113 281 6860. 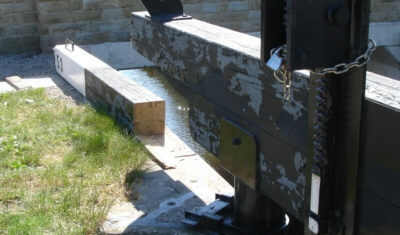 Lock 2w of the Huddersfield Narrow Canal in Ashton has once again got balance beams on its tail gates! Boaters will be relieved to know that the hydraulic gate and paddle mechanisms have been consigned to history! The bridge that crosses the lock tail was widened during the period when the canal was shut. When the canal was restored, there was no room for traditional balance beams, so a hydraulic system was introduced instead. Operating this lock was time-consuming and required considerable effort. The tail gates also leaked badly where there was a big gap between them near the top when they were closed. The hydraulic mechanisms have now gone completely, to be replaced with well-designed steel crooked beams and geared gate paddle operation along with brand-new gates. The tiresome hydraulic tail gates and paddles remain at Lock 1w, however. During this winter's repair work around Lock 2w, 12 tonnes of waste material were removed from the lock chamber! Further east along the canal, 100 Tesco and Somerfield shopping trolleys have been removed from the canal at Stalybridge. Hirst Swing Bridge, between Shipley and Bingley, has jammed in the closed position. The pintle beam of the bridge has collapsed, making it inoperable by boaters. 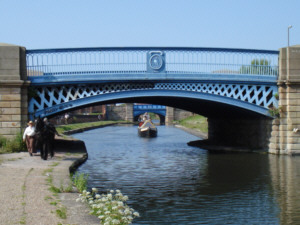 British Waterways is currently exploring alternative routes for offside businesses and residential properties via adjacent playing fields, so that the bridge can be swung free to allow the canal to re-open for boating traffic. In the meantime, it is planned that British Waterways staff will be at the bridge between 11.00 am and 1.00 pm each day until further notice, to enable boats to navigate through the bridge hole. Please phone the number below to confirm this before setting out. For the latest information on this and other stoppages in the Yorkshire area, boaters can phone 0113 281 6860. 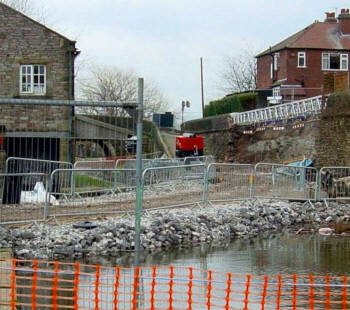 A stoppage on the Rochdale Canal at Trub, Castleton, has been extended beyond its expected completion date. BW is offering restricted opening times in order to allow boats through. See details below. The original stoppage was for the construction of a new access bridge just north of the tunnel beneath the M62. This was to replace the temporary bridge that had to be constructed when the canal was re-opened in 2001. The bridge is nearing completion and the canal was due to be re-opened on March 16th. However, in February an "incident" occurred just below the new Lock 53, to the south of the M62 tunnel. A section of bank was "vandalised", allowing water to escape. This was at a point where the canal is retained by a fairly narrow bank, with the field sloping downwards beyond. The water level dropped by more than a foot. 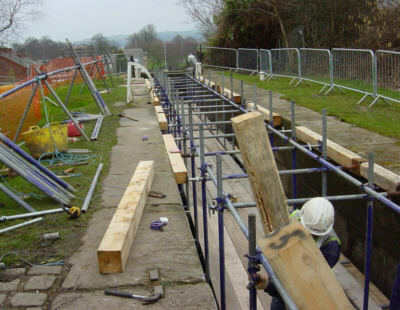 British Waterways have made temporary repairs but a more permanent repair will be needed to ensure the stability of the bank. BW's engineers have been looking at the repair options available and it is expected that piling will be used, working from a boat. BW has had to seek Natural England consent for the works, which are within the protected Site of Special Scientific Interest. Subject to these consents being granted, the work should be completed and the canal fully opened by Monday 30th April. However, in order to allow boaters to navigate this section of canal before the work is completed, BW is introducing restricted opening times from Monday 26th March. The pound between Locks 53 ansd 54 will be open between 10.00 am and 3.00 pm only. Staff will inspect the damaged bank each morning to ensure that passage will be safe. Booking for this section is not required, but is still needed for Locks 83 to 65 and over the Summit. Overnight mooring above Lock 54 at Slattocks will be discouraged. Suitable moorings can be found the Rose of Lancaster / Irk Aqueduct and at Littleborough. Photo, top: The new bridge nears completion. Photo, bottom: The site of the damage, after temporary repairs have been made. 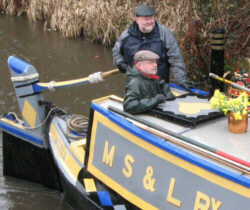 A series of "Waterway Community Days" took place around the country over the weekend of 3rd and 4th March. 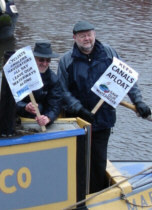 These events brought together a range of waterway users to protest at the cuts in funding by Defra to British Waterways and the Environment Agency. In the north, events were held at Ashton, Garstang, Macclesfield, Northwich, Tarleton and Wheelton. The Ashton event was attended by David Heyes, MP for Ashton under Lyne, who took the tiller of the horse-drawn boat Maria all the way from Guide Bridge to Portland Basin! Another member of the crew was IWA Chairman John Fletcher! 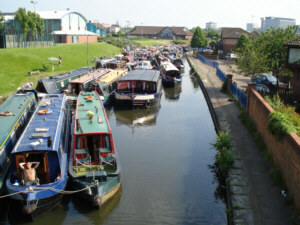 14 narrowboats and their crews braved the elements to make the journey to attend the event, which took place at Portland Basin at the junction of the Ashton and Peak Forest Canals. They were greeted by other waterway users who had turned out to the gathering on a very wet and windy afternoon. Above: Protesters at Portland Basin. Far left: David Heyes MP steers Maria towards Portland basin. Left: IWA Chairman John Fletcher with Ashton under Lyne MP David Heyes. Photos of the events around the country can be seen here. This year's annual Towpath Tidy will be held during the week commencing 26th March. Waterway volunteers are invited to join BW office staff and maintenance teams to spring clean the waterways ahead of the main boating and visitor season. If anyone wishes to join in the Spring Clean please contact Sarah Lalieu on 01942 405700, unless shown differently above. 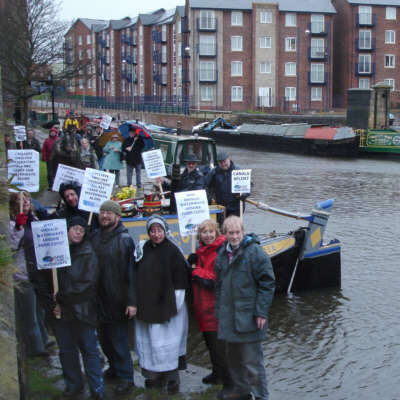 Following the weekend of water-borne demonstrations which took place last November, a series of "Waterway Community Days" are to take place around the country over the weekend of 3rd and 4th March 2007. These events are designed to bring together a range of waterway users to protest at the cuts in funding by Defra to British Waterways and the Environment Agency. Ashton under Lyne, Greater Manchester, junction of Ashton and Peak Forest Canals. 12.00 noon to 4.00 pm, Sunday 4th March. 12.30 to 4.00 pm, Saturday 3rd March. Outside Hovis Mill at 12.30 pm Saturday 3rd March. Tarleton, Lancashire, Rufford Branch, Leeds and Liverpool Canal. 2.00 to 4.00 pm, Saturday 3rd March. Northwich, Cheshire, Northwich Town Centre, beside River Weaver. 10.30 am to 4.00 pm, Saturday 3rd March. Wheelton, Lancashire, above Johnsons Hillock Locks on the Leeds and Liverpool Canal. 10.00 am Saturday 3rd March - 2.00 pm Sunday 4th March. 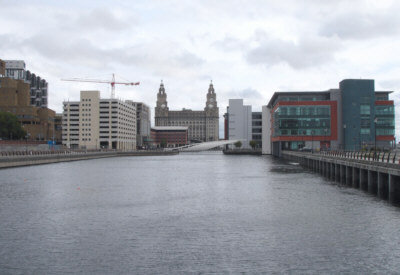 Prince's Dock on the new Liverpool Link. British Waterways has agreed to extend its arrangement with the Manchester Ship Canal Company to allow pleasure craft displaying a valid Bridgewater Canal licence to travel further. Starting from the time when the Liverpool Canal Link opens in 2008, Bridgewater licence holders will be able to travel along the Leeds and Liverpool Canal beyond Burscough and to use the Liverpool Canal Link through to the Albert Dock. Currently, Bridgewater licence holders can travel for a period of seven days free of charge along the Leigh Branch and from Wigan to Burscough and from Wigan to the bottom of Blackburn Locks. In a reciprocal agreement, BW licence holders can use the Bridgewater Canal free of charge for up to seven days. The new agreement was reached following a request by a boater on the Bridgewater Canal. 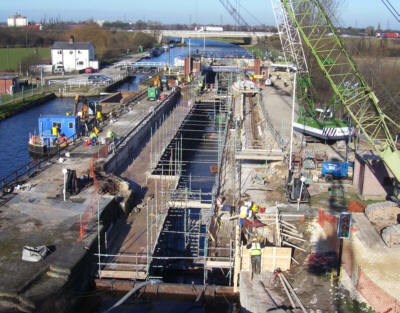 Whitley Lock, on the Aire and Calder Navigation between Knottingley and Goole, is undergoing major work this winter. 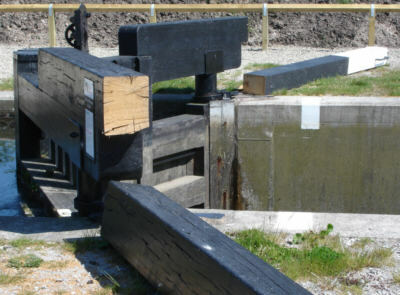 The lock, which was originally constructed in 1821, is unusual in having three sets of gates and two chambers, which can be used in combination to allow the passage of long vessels. The lock is subject to subsidence caused by coal working at nearby Great Heck, so the downstream chamber is having to have its walls raised by 0.5 metres. The three massive sets of gates are also being replaced. This is requiring two 55 tonne cranes and one 80 tonne crane to lift out the old gates and replace them with new ones. The new gates have been made at British Waterways' Stanley Ferry workshop near Wakefield which makes gates out of oak for the whole of the waterway network. 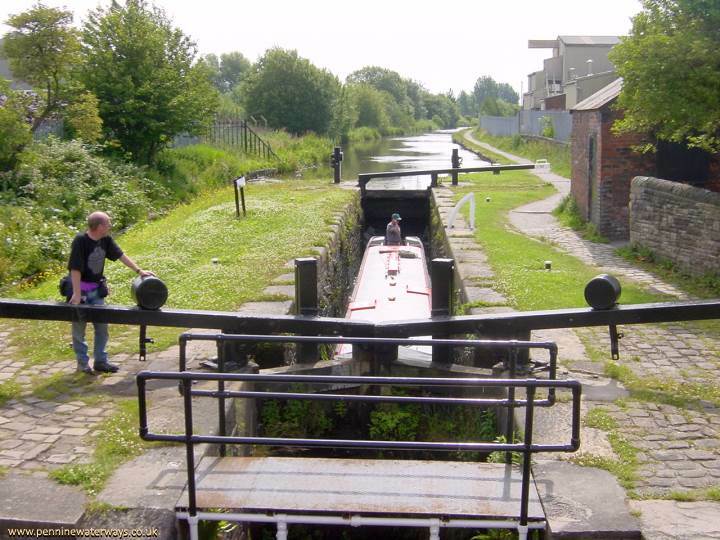 Approximately half a million tonnes of freight are carried through Whitley Lock each year. The freight carried includes bulk oil, aggregates and steel. UK Coal has agreed to limit the extraction of coal from the seam being worked from the 600-man Kellingley Colliery at Knottingley, and install monitoring equipment to check subsidence levels. Laurence Morgan, General Manager, British Waterways Yorkshire said: "This is a major engineering project and is in fact currently the biggest scheme on BW's waterway network. The Aire and Calder is our main freight carrying waterway and we have been working closely with UK Coal to carry out the work." The work is due to be completed by the end of February. British Waterways has announced a poetry competition for children to launch the 2007 season at Standedge Tunnel and Visitor Centre. 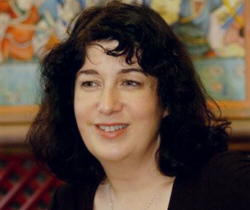 Three lucky winners and their families will be treated to a free boat trip into the tunnel on April 1st along with well-known author Joanna Harris. Children are invited to enter a competition to win the free trip by writing a poem about one of the tunnel's famous workers, Thomas Bourne. Thomas used to walk the boathorses 'over the top' from Marsden to Diggle and back again while the boaters legged their boats more than 3 miles through the tunnel. During his life as a canal worker, Thomas walked this trip four times daily and clocked up a total of more than 215,000 miles. The education and community room on the first floor of the Visitor Centre will be named The Thomas Bourne Room, and Joanne cut the ribbon to declare the facility officially open this year for local schools, groups and organisations to use. Entries for the competition, which is open to children aged between 7 and 15 years old, should be posted to Simon Henry, Marketing & Communications Assistant, British Waterways, Fearns Wharf, Neptune Street, Leeds, LS9 8PB or emailed to simon.henry@britishwaterways.co.uk by 16 March 2007. Winners will be notified the following week. During 2007 Standedge will be open from 1st April to 2nd November on six days a week - Tuesdays to Sundays (closed Mondays, except for Bank Holidays). Entry to the Visitor Centre is free and it will be open 10 am - 5.30 pm. The guided boat trips into the tunnel operate at 10:15am, 11:00am, 11:45am, 1:45pm, 2:30pm, 3:15pm and 4:00pm (first two trips run subject to numbers). British Waterways is to close its Castleford offices in Yorkshire as part of the ongoing streamlining of its operations. The Customer Services team for Yorkshire is to re-locate to BW's offices at Fearns Wharf in Leeds on 5th February 2007. According to British Waterways, this is part of the commitment by British Waterways' staff to new ways of working, which will involve 'hot desking' for those staff who spend much of their time out of the office working at various sites along the waterways. Staff from the Apperley Bridge office will also be moving to Leeds, so that all Yorkshire Waterways staff, apart from those at the Tees Barrage, will be based in the Fearns Wharf building, opposite the Royal Armouries, on the banks of the River Aire. Laurence Morgan , general manager of British Waterways Yorkshire, said: "We believe that amalgamating all of our teams under one roof, in the heart of Leeds, will make for a more efficient operation. Many of our office staff are involved in travelling all over the region and so we are able to get the best value from our office space by hot desking and by facilitating mobile and home working." "British Waterways has already carried out a similar operation in our North West region, with a new office base at Wigan which has proved extremely successful." The telephone number for the Leeds office is 0113 281 6800. The Castleford number will be diverted so will continue to work for some time. The very high winds of 18th January have resulted in the temporary closure of several canals in the area. A large number of trees have come down across the Lancaster Canal south of Galgate. Contractors are currently assessing the trees to be removed. Due to the high number of trees, British Waterways will post an update on the likely duration of the works early next week. Update: Most trees have now been removed. The canal is still closed between Bridges 38 and 39 but should be open by 24th January. Update: All fallen trees have now been removed. - Bridge 76-77: restricted navigation, towpath closed. Various stretches of the Bridgewater Canal have been blocked by fallen trees. In addition, the roof of a 10 storey building in Hulme has fallen into the canal. The Manchester Ship Canal Company Engineering section has started assessing the damage. The clean-up operation began today (Friday 19th January) and will continue over the weekend. Full navigation will be restored as quickly as possible. Update: These blockages have now been cleared and the navigation has reopened. Near Skipton, a lorry driver was killed when his articulated truck was blown off a high level bridge carrying the bypass across the Leeds and Liverpool Canal. The cab fell into a field while the empty trailer ended up in the canal. BW staff were called out to seal off the canal and deal with diesel fuel leaking into the water. The canal will remain closed until recovery is complete. Update 30th Jan: The canal has now been re-opened at this point. 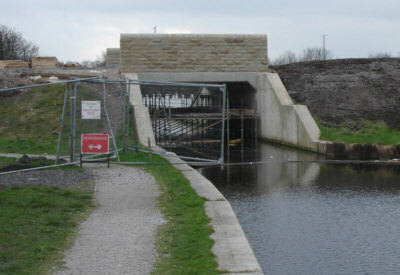 At Coxheads Swing Bridge on the Leeds and Liverpool Canal near Lidiate, an automatic barrier was badly damaged by the wind. The electrical supply to the bridge has been turned. It remains open to road traffic. A new barrier has been ordered. Update: Temporary repairs have been carried out and the canal is now open to navigation again. There will be a stoppage on Wed 24th Jan for the new barrier to be fitted. The Leeds and Liverpool Canal has also been blocked by a fallen tree at Rodley, near Leeds. The Rufford Branch of the Leeds and Liverpool Canal has been blocked by a fallen tree near Rufford Hall. Update: This blockage has now been cleared. A number of trees have fallen across the Lower Peak Forest Canal between Bridges 3 and 4 at Dukinfield, and near Bridge 8, south of Hyde, blocking through navigation and the towpath. Update: These trees have now been removed. The Upper Peak Forest Canal and towpath has been blocked by fallen trees between Bridges 27 (Disley) and 28 (New Mills). 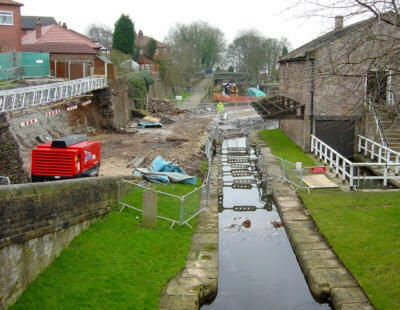 Repairs to a collapsed wall at Marple will mean the closure of part of the Macclesfield Canal for 11 weeks. A retaining wall alongside the Macclesfield Canal towpath, close to the junction with the Peak Forest Canal, is to be repaired. A dam will be constructed within the canal channel to provide access to the construction site. Therefore the channel between bridges 1 and 2 at Marple will be closed to through navigation. This closure will be from January 15th until April 1st. For health and safety reasons, the towpath will be also closed for the duration of the works, and until 20th April 2007. A pedestrian diversion will be in place. Access to the visitor moorings and Marple service station will be restricted during these works. Update notices on progress will be issued and customers should check with the local office before travelling. The retaining wall has been in a precarious condition for some time. 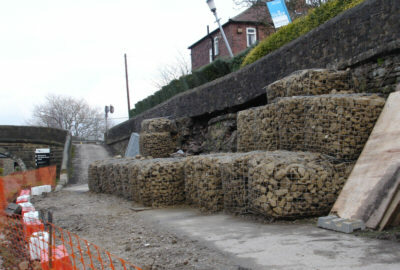 The photo shows temporary stabilisation work being carried out in March 2006. Note the angle of the undermined lamp post! Read details and see photos of the work under way. A new series of the TV programme "Locks and Quays", starts tonight, 4th January, on ITV in the North West. This second series of ten programmes features Fred Talbot on a journey by narrowboat from Bugsworth Basin, by way of the Peak Forest, Ashton and Rochdale Canals to Hebden Bridge. Inserts featuring other canals, people or places of interest will appear in each programme. These include items about the Huddersfield Narrow and Hollinwood Branch Canals. The programmes are broadcast on ITV in the Granada area at 7.30 pm on Thursdays. They can also be seen by people outside the area on Sky. The makers, Centini Television, are hoping to make a DVD of the series available later. Granada is available on Astra 2 (Sky): 10758MHz, Vertical, 22000SR, 5/6FEC. See: www.lyngsat.com/28east.html for more information.